Only a year later after General Dynamics Information Technology (GDIT) made the move to acquire CSRA, we’re living in a different (but same) world. We’ve been through eras of consolidation and divestitures over and over again. 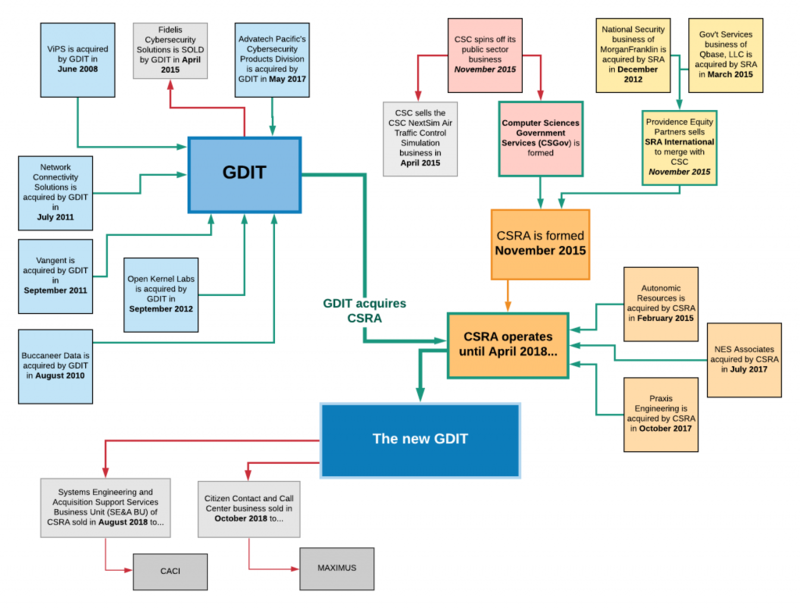 How did today’s GDIT come together even if we define it through M&A actions? This is not as simple as CSRA + GDIT = “Buckle up, buttercup.” Both CSRA and GDIT were no strangers to acquisition, and the April 2018 acquisition of CSRA was significant, but it was far from the only ingredient into making the GDIT that exists today. Figure 1 – Over the hills and through the M&A woods to GDIT we go. 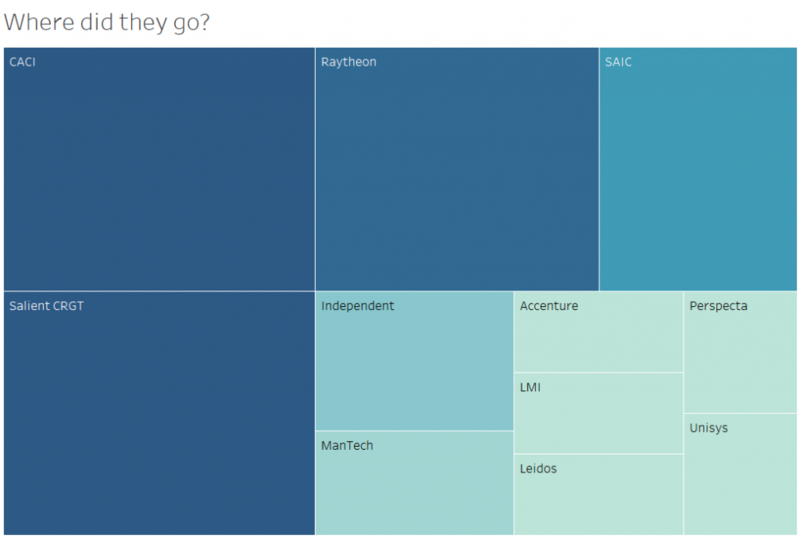 Why did we look at GDIT through the lens of M&A? We did that to illustrate it did not come to be a major GOVCON IT and professional services provider purely through wins. Knowing the heritage helps to reveal legacy of people, customers and “uniques.” For instance, we know that the July 2017 NES Associates acquisition significantly bolstered the company’s IT portfolio within the Defense Information Systems Agency. 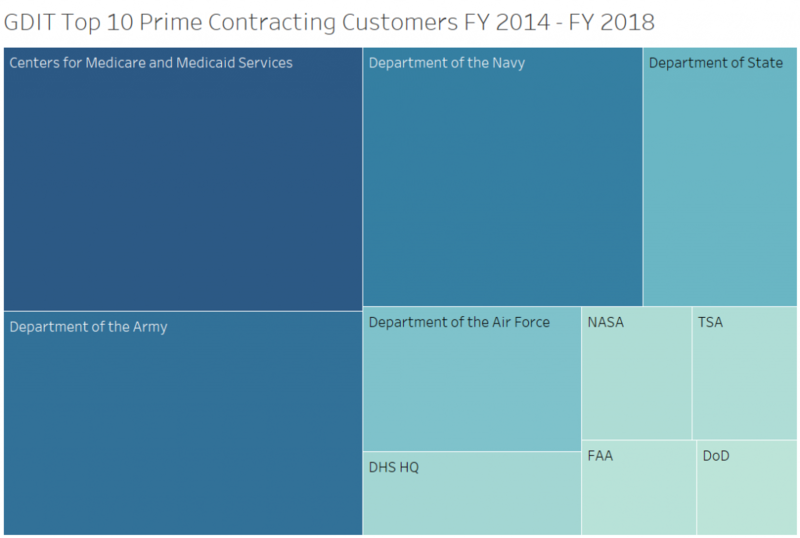 Much of the company’s work can be tracked back to previous entities, and while the contract work has stayed within General Dynamics, many of the personnel have not…. Post M&A, we always witness personnel moves driven by a variety of reasons (voluntary and not voluntary). As the exodus has happened for a year, we wanted to identify where clusters of the GD/CSRA alumni club went directly from GD/CSRA. We focused on the people involved in the “hunt” we all know and love so very much. This is based on a sample of persons we could verify made a move shortly before the sale of CSRA to GDIT was closed or within the year following the close. Figure 2 – BDs, captures and executives tended to cluster in a few major GOVCONs with some other destinations being less prevalent. Figure 3 – Different GOVCONs picked up different types of pilgrims moving out of GDIT. Who’s buying from GDIT? Take a look below for a simple overview. Figure 4 – GDIT’s customers may not be who you would expect. Note that this will change over time with some of their more major wins and losses…hint: some notable losses will erase some customers from the above. As we often find ourselves competing in a zero-sum game, re-competes are sacred to be protected. As GDIT looks to defend its organic and acquired portfolio, they have some defending to do. Below is a sample of some re-competes. U.S. Department of State, Global Support Strategy (GSS) – This 10-year, multiple award IDIQ contract was awarded to Legacy CSRA to support nonimmigrant and immigrant visa operations around the world for the Bureau of Consular Affairs. General Dynamics IT has been obligated $1.1 billion under the contract’s healthy $2.8 billion ceiling. If all goes according to schedule, the GSS IDIQ is slated to expire in February 2020 and will be replaced by GSS 2.0. U.S. Department of Homeland Security (DHS), Data Center 1 (DC1) – This sole source award edges ever closer to some form of its next iteration as the current $967 million ceiling contract (with $923 million obligated) comes to a close in March 2020. It’s safe to state that major competitors are already working on this major capture (yes, and in other news water is wet). U.S. Department of the Navy, OCONUS Navy Enterprise Network (ONE-NET) now NGEN-R – General Dynamics’s OCONUS Navy Enterprise Network (ONE-NET) contract is currently under recompete as part of the Next Generation Enterprise Network (NGEN) Recompete family of contracts. Awarded to legacy CSRA, the company has been obligated $210 million to date between the ONE-NET contract and the ongoing ONE-NET bridge. General Dynamics will support the bridge extension through May 2020. U.S. Department of Veterans Affairs, Intake, Conversion, and Mail Handling Services (ICMHS)— Yet another legacy CSRA contract, the ICMHS program manages benefits claims materials, mail handling, and material conversion for the VA’s benefit management system. Currently spending $126 million under the $233 million ceiling, this VA T4 task order will expire in December 2020. What other contracts help to define GDIT? Through the acquisition of CSRA, GDIT is doubling down on cloud services. With several major ongoing cloud contracts, including the $110 million ceiling value FAA Cloud Services (FCS) contract and the $361 million obligated value CMS Virtual Data Center Prime (VDCP) contract, GDIT is poised further build out its cloud work using the legacy CSRA’s catalog of managed cloud services. To emphasize the fact that CMS is GDIT’s largest federal customer, the company was recently awarded a seat on the CMS Measure and Instrument Development and Support (MIDS) IDIQ. This 10-year, multiple award contract has a collective ceiling of $1.6 billion. This is more of an adjacent move for GDIT to continue to expand across CMS to be less IT-centric and increasingly more mission focused. In February 2019, GDIT celebrated a recompete win with the award of the DISA Enterprise Transport Management-Next Generation (ETM-NG). This $491 million ceiling value BPA provides full O&M for networks in the National Capital Region for DISA’s Joint Service Provider (JSP). General Dynamics is currently supporting the program under a $108 million obligated value bridge that will expire and transition to the ETM-NG contract in December 2019. In the coming months, GDIT will have some big recompetes hanging in the balance. While the combined GDIT-CSRA entity now has formidable total IT capabilities, it is unclear how they will fare as they have lost significant numbers of capture personnel. Moving the needle on GDIT’s growth will be difficult as a very large business. It’s almost certain that they will adjust bidding criteria in order to realize growth although legacy GDIT management has been typically conservative in their pursuit strategy.